What Is “Historical” Weight and Balance? … and why you want to keep those records. What is “Historical Weight and Balance” and why should you care about it? Furthermore, what should you do with it? Historical weight and balance is a term I use and feel appropriate for “old” weight and balance reports, the ones that are superseded. It’s critical that these documents be maintained in your permanent aircraft file for future reference when items are removed or new items are installed. 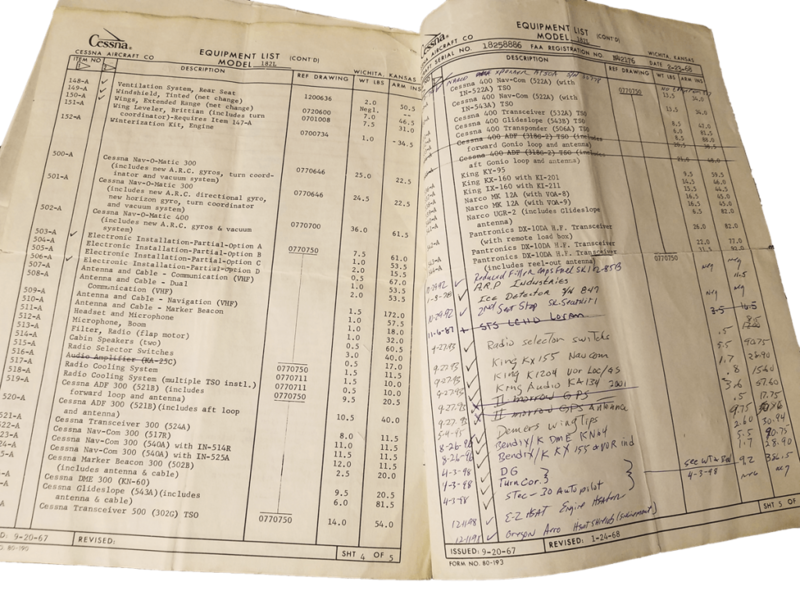 Not only are they a piece of your aircraft’s history, they create a paper trail and diary of previous configurations that can be researched by modern “aircraft archeologists” like myself, not only for “gee whiz” type interest, but for actual use as well. If you have an older airplane like I do, you will eventually need to update the weight and balance for a new installation of modern equipment. When your mechanic needs to do this they need to know the weight and arm of the items removed and added. Having all the previous weight and balance reports available makes this task much easier and more precise, especially when using the mathematical method vs. actual aircraft weighing. For instance, if your airplane had a major avionics upgrade in 1982, and a full report of removed and installed equipment was generated; it would be of great value to a person running a new report during an avionics installation today to have the old data when they update the report for the new installation. The reason is because they can refer to the previous weights and arms used for previous changes to the report rather than weighing and measuring all over again. Often fresh actual weights and arms will vary from those used to alter the report in the first place, and this creates compounding error in the “mathematical” version of the report that can become substantial after multiple changes with differing figures. Think about it. If in 1982 a shop removed a radio the factory said weighed 7.1 pounds at an arm of 24.6 inches, and installed a new radio at the same arm with a new weight of 5.3 pounds, in 2018 when you install a new radio wouldn’t you want to “remove” the old radio at 5.3 pounds and 24.6 inches, and then “install” your new “X.X” pound radio at 24.6 inches, vs. using the weights and arms of a radio that was no longer installed? Your historical weight and balances should be kept with the log books in the aircraft file along with your Instructions for Continued Airworthiness, 337s, STC paperwork, and AD list. This will make it easy for your mechanic to look back on previous installations and keep your weight and balance as accurate as possible. Of course, weighing an airplane is the best method for determining current weight and CG, but even after this is done, it’s very valuable to maintain the records of previously removed and installed items for the reasons stated above!